Want to have the healthiest, safest and best pregnancy possible? Of course you do. We want that for you as well… in fact, we would love your pregnancy to be extraordinary! We want your child to have the best chance at entering this world as healthy as possible… and will do what we can to help make their birth the best experience possible. If you’re planning a pregnancy, the best time to start chiropractic care is before you conceive. Why? Because increasing your health can make conception even easier! Your baby’s future health is determined by all the choices you’ve made up to this point. So, when you conceive your child you want to be the healthiest you can be… and we can help. Chiropractors at The Powerhouse do specialized testing to determine if you have a core problem with your spine and underlying nerve system (brain – spinal cord – nerves to organs, glands, tissues and muscles). By addressing this core problem, your brain and nerve system function can be improved. ..as your body will be rapidly changing over the next 9 months. There are many great benefits to having chiropractic care during your pregnancy. If you would like to find out more… take action now and book a free consultation with one of the Doctors at The Powerhouse Chiropractic and check out some of our most popular pregnancy blogs here. “A big thank you to The Powerhouse team and especially to Dr. Brian for all of the care I received throughout my pregnancy. I was unaware of the benefits of chiropractic care tailored for pregnancy but decided to seek some treatment based on a more holistic approach to birth. I found out that good chiropractic care is clinically proven to shorten labour and keep your spine and pelvis aligned for ease of delivery. Emily is not the first to benefit from chiropractic care during pregnancy, and the benefits she experienced first-hand have been studied before. Researchers have shown chiropractic care during pregnancy can help ease delivery. In one study, a woman who had a long, difficult delivery for her first child sought out chiropractic care. After the delivery of her first baby, she wanted to correct the core problem with her spine and nerve system, and limit the pain she was experiencing at the tip of her tailbone. Researchers and Chirorpactors are studying which techniques are most effective during pregnancy, and we are proud to see so many moms-to-be at The Powerhouse. 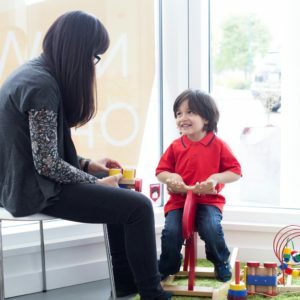 We also love to care for the kiddos afterward! How does the chiropractor adjust for my changing body? As you progress through your pregnancy, your belly will grow to accomodate your growing baby. This makes lying on your front uncomfortable, so we use specialized equipment and pregnancy-specific techniques so you’re at ease during your visits. Approximately 43% of all deliveries in Canada are vaginal and without complication. A breech birthing position occurs when the baby is positioned feet-first instead of headfirst in the birthing canal. Check out this other article we wrote all about breech positioning. This can be a difficult delivery position and increases the risk for both mother and child. Learning your baby is in this position often precedes the decision to have a caesarean section. Recovery times for caesareans can be long… so for those wanting to have a vaginal birth, ensuring your baby is in a good position before labour begins is important. Our Doctors are trained to use Webster technique, a specific Chiropractic technique used to facilitate pelvic alignment and ease the soft tissues of the pelvis and belly. Your baby is then better able to reposition out of the breech position and into the more common head-down birthing position. This not only allows for an easier vaginal birth, but also helps avoid unnecessary surgeries that can be difficult for both you and your baby. The healing requirements post-caesarean are very demanding on a new mom. After a vaginal birth, most new mothers stay in the hospital for 24-48 hours. Following a caesarian section, one could expect to stay in the hospital for four days. Surgery also makes it difficult to perform certain movements, including picking up anything heavier than your new baby. Carrying a car seat and a baby is too heavy post-caesarean, making it difficult to get around. A 35-year-old mother pregnant with her second child visited her chiropractor at 34 weeks pregnant. This mother had a history of cesarean section, and wanted to undergo chiropractic care so she could have a vaginal birth with her second child. During a routine ultrasound, her obstetrican found her fetus was in a frank breech position (which means her baby’s feet would be first to enter the birth canal). Over the course of two weeks, the patient was analyzed and received corrections by her Chiropractor when necessary. She had four chiropractic corrections before reporting vertex positioning of the fetus, meaning the baby was positioned head first (confirmed by her obstetrician via ultrasound). The patient went on to have a successful, natural, vaginal birth with no reported complications. At The Powerhouse, we are proud to provide individualized attention and ongoing chiropractic care to our practice members. Chiropractic care at The Powerhouse can be helpful for both your changing body and your peace of mind. 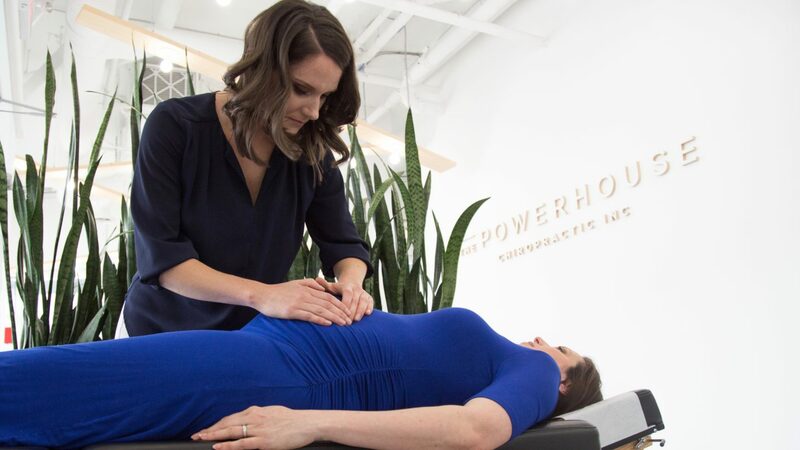 If you are thinking about chiropractic care during your pregnancy, or are planning a pregnancy, schedule your free consultation with one of our Doctors at The Powerhouse. We look forward to meeting your growing family!